There is some truth in the saying that collectors are trying to regain a youth they never had. I love to see and hear things that I would love to have seen and heard as a child. And, like I said before, I keep mindspace for the possibility that my present mind is in some mysterious way connected with my child-mind. Maybe the me that I was 40 years ago is indeed enjoying the record that I describe at this very moment. Actually it is not one record, but a whole series. And it are not just records, but books that can also played on a record player. The books/records were published by Mulder&Zoon in the sixties. It is a series of fairy tales, told by Lien de Reuver, Jan Smit and Annie Fry. There were many record with abridged and censored fairy tales made for children in the sixties, and these Mulder records are nothing special. Except for the fact that they are packed in beautiful little books, with illustrations by Nans van Leeuwen and L. van Groen. 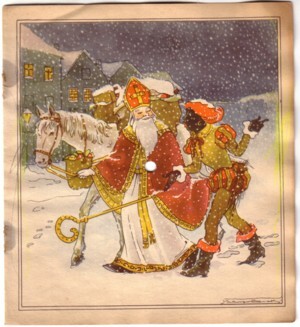 Apart from the obvious fairy tales that nobody cares for (I still miss De Kikkerkoning and De Gelaarsde kat , by the way) they released a Sinterklaas edition. Actually they made two. I have both, but one is severly mutilated, and the book is missing. 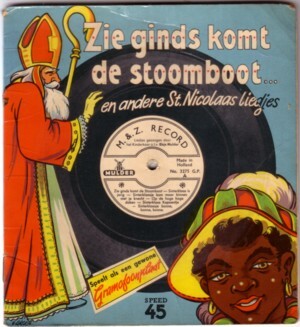 On these Sinterklaas records is only music. Well, not really music, but little children singing Sint Nicolaas songs. 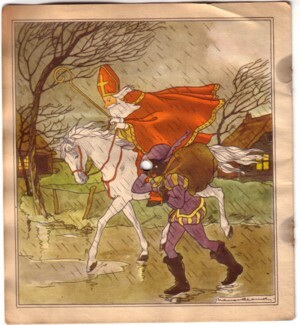 I will spare you that, but I do want to show you some of the illustrations, because they capture the essence of the Sint myth very well. 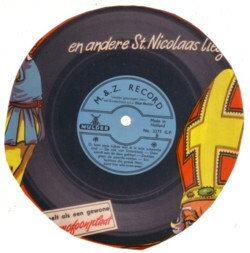 I got a mail from Bas Trimbach, who wrote a nice sotry about his Sinterklaas record collection on his blog. 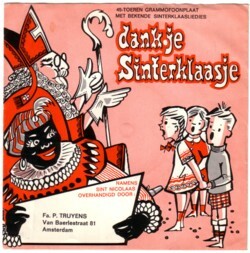 He mentions a project of making a CD with only unknown Sinterklaas songs. I have been trying that too, but failed so far for the same reasons as he mentions. But here is one such song, from a Dutch Advertisement Record, made around 1970 by an anonumous organisation for shop owners.